He lived during the golden age of masks in Venice, but well embodies their decline. He became a first-rank playwright, by creating a turning point in the Commedia dell’Arte. He is a milestone for Italian literature and a symbol for the end of the age of masks in Venice. This is the story of Carlo Goldoni’s new idea of theatre. Especially during the 17th century, Venice’s theatrical tradition was blooming: this was related to the economical crisis trade and markets were facing, too, which led to investments in other businesses, such as printing and theatre. By the 18th century, anyway, the quality of theatre shows was poor, since actors constantly repeated the same sketches. The Commedia dell’Arte is, indeed, chiefly based on drafts – the so-called canovacci – and ad-libbing actors. Carlo Goldoni (Venice, 1707 – Paris, 1793), however, manages to improve this quality, by drawing real characters instead of Masks. It is to Goldoni, then, that we owe a detailed description of the life led by the Venetian middle class, especially in plays such as La locandiera. His first works, though, were still under the scope of the Commedia dell’Arte. In his preface to the comedy The father of a family, Goldoni admits having introduced the character of Harlequin out of courtesy, as one of those sacrifices sometimes Authors are compelled to make. That is, Goldoni has to bend to the will of theatre managers and of the audience. Such a compromise is realised by the comedy A servant of two masters (Il servitore di due padroni), whose main character is Truffaldino (“Swindler”), one of the alternative names of Harlequin. This mask can indeed be considered as the heart-and-soul of the Commedia dell’Arte: as an anti-hero par excellence, Harlequin enjoys more freedom even than the other Masks, since he can do any roguery. Goldoni is aware of the features of this mask, a catalyst for all the negative aspects of the Old Theatre he strives to wash away: in order to wipe out the “indecent Harlequinades”, as he calls them, he knows he must grant the Author a central role in the planning of a play, by binding characters to a wholly written text. 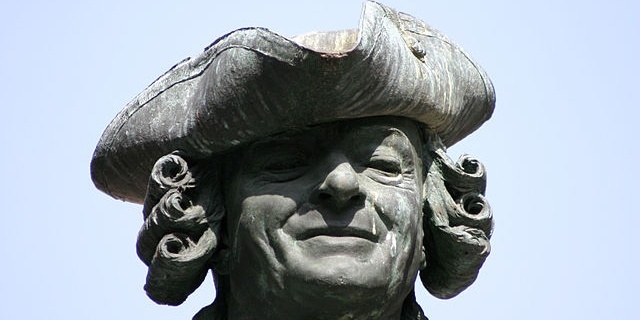 Goldoni is therefore a reformer of the theatre, although during his life he has to face many an foe, due to the everlasting quarrels with those who supported a traditional idea of theatre. Such a theatre, though, was doomed to vanish, just as the costume of mask-wearing: Goldoni sees it and manages to give a new life to the theatrical world, by turning it into a modern one. Here we go again, another servant’s mask of the Commedia dell’Arte. All that glitters is not gold, the saying goes: and this is true of the glitter on masks, as well.